For the most part, thrift shopping in SF is pointless. It’s all picked over, marked up, “vintage” Forever 21 pieces, or odd sizes. But there are two huge exceptions. 1. Men’s wear- I can wax poetic for hours over the incredible finds we’ve brought home for my husband. Calvin Klein button up shirts for $14, Dolce & Gabanna sweaters, great shoes. Good deals are super findable because frankly? Many guys don’t shop second hand, and those who do don’t know labels and pass over excellent items. 2. Jewelry, books, and home items at The Goodwill on Clement. My theory is this Goodwill is on the fringe of the fancy neighborhood so it receives donations of under the radar items that don’t have much of a resale market. But Clement street is very immigrant heavy, and I think the people who shop here are looking for practical items. What falls in the cross over of this Venn diagram? The less practical nicer quality stuff. Decorative vases, interesting jewelry pieces, and, well I don’t know how James Patterson books fit into my theory but I find lots of them too. 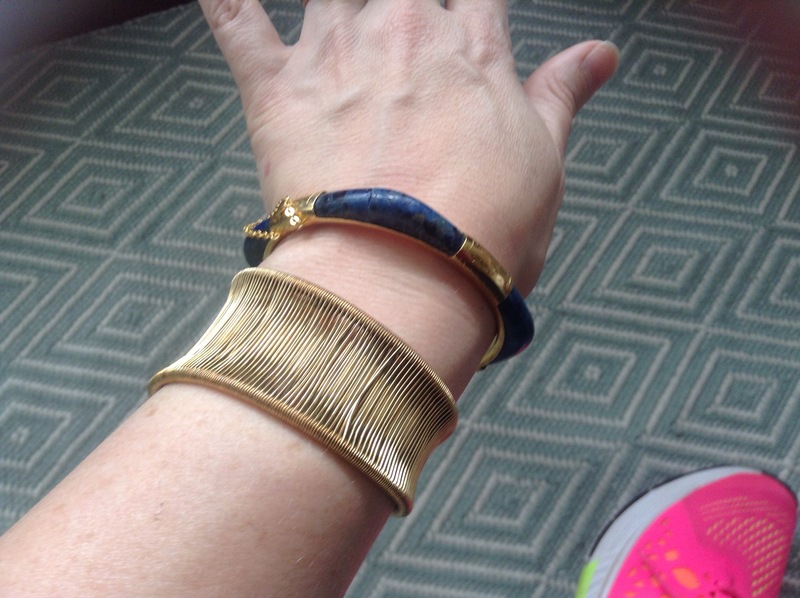 A brass wire wrapped cuff, with an asymmetrical shape to it and a brass and blue lapis bangle with a tiny little heart clasp. Pretty cute, right?? Big pat on the back for me. What do you guys think? 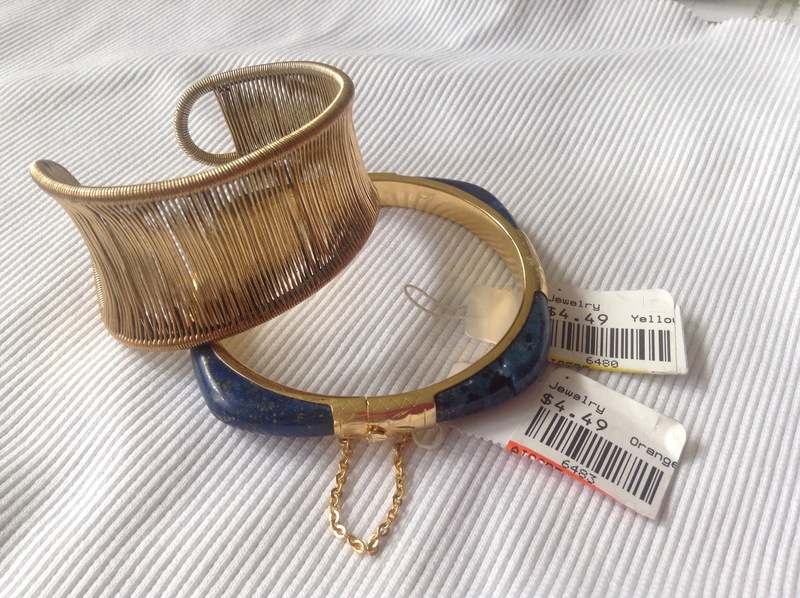 You find any great second hand items lately? I love going to charity shops- I love the unknown of what will be found. Here in Copenhagen there is a lot of good stuff to be had- I think the trick is knowing when they rotate stock, and yes, knowing the posher and not so posh areas. I sometimes unknit items that I’ve made and so started thinking about the sweaters at goodwill- I should see if there are any good materials I could unknit to use for my knitting projects. As a knitter, what do you think? That’s a cool idea- it definitely works if you find the right stuff, but there’s a few things to watch out for. First, check the garment label- that will tell you what you’ve got- wool, cotton etc. Then look at the fabric- pass it over if it looks bobbley/worn/felted because it may be a nightmare to undo and not be reuse-worthy. Then look at the spacing of your knit fabric- does it look like you can undo it? If it’s loose/not too tight then it’s probably ok.